As the composer of such quintessentially American songs such as “God Bless America” “White Christmas” and “Alexander’s Ragtime Band”, Irving Berlin’s music can be quickly defined as American music. In spite of his exceptional ability to capture the spirit of America, he was born in Belarus formerly the Soviet Union (although his family emigrated to the United States when he was five). Irving Berlin composed ballads, dance numbers, novelty tunes and love songs that defined American popular song. Later in life, Berlin was credited to being a songwriter who reflected the feeling of the crowd. In saying this, Berlin could capture that common American talk and made those words and feelings into poetry and music that was simple and graceful and easy to understand and connect to. 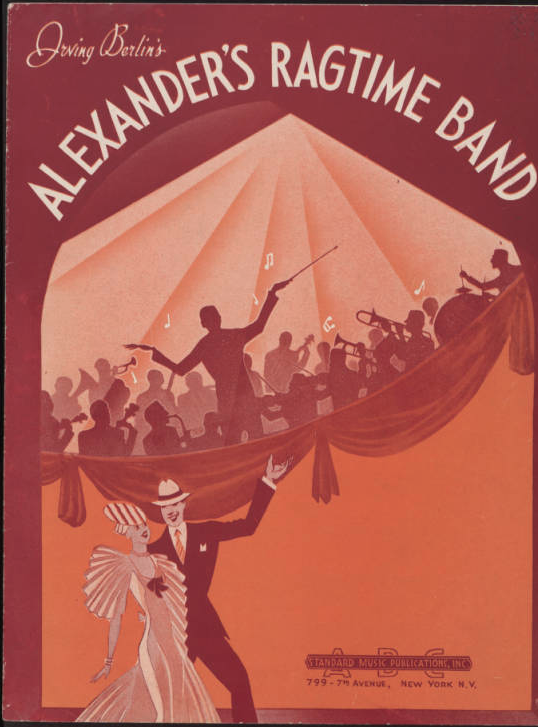 Berlin wrote his first song “Alexander’s Ragtime Band” in 1911 later receiving great acclaim and eventually selling over one million copies of sheet music. Not only acclaimed for his brilliant compositional style, Berlin was also attributed to his skillful ability to write his own text. In each piece his words could relate to any listener and earned a generally high approval of any work that he did. Over five decades Irving Berlin was able to keep up with the trending styles and wrote music and lyrics for close to 1,000 songs during his lifetime. Through the myriad of genres and audiences to which he contributed, Irving Berlin assimilated into the American culture for which he was one of the primary providers. In 1988 at Carnegie Hall, famous musicians speakers and fans gathered to commemorate Berlin’s works on his 100th birthday. Irving Berlin lived to be 101. “Irving Berlin’s Alexander’s Ragtime Band.” Irving Berlin’s Alexander’s Ragtime Band. 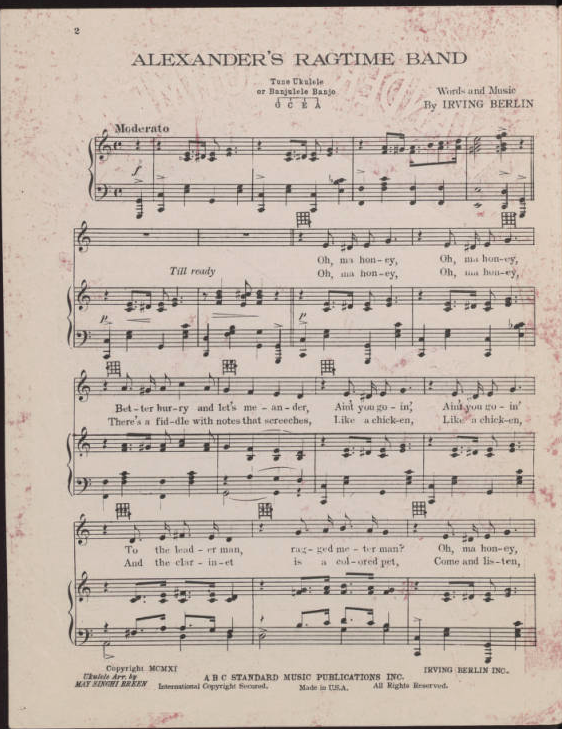 :: Frances G. Spencer Collection of American Popular Sheet Music. Frances G. Spencer Collection of American Popular Sheet Music. Web. 13 Apr. 2015. <http://contentdm.baylor.edu/cdm/ref/collection/fa-spnc/id/18342>. “IRVING BERLIN’S 100TH BIRTHDAY CELEBRATION .28.” YouTube. YouTube. Web. 13 Apr. 2015. <https://www.youtube.com/watch?v=4uV4frZIkIQ&feature=player_embedded>. 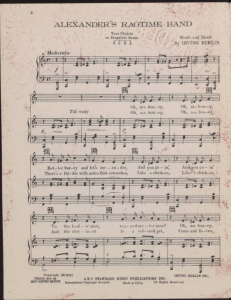 This entry was posted in Chloe Elzey and tagged Alexander's Ragtime Band, American, American Music, Irving Berlin by Chloe Elzey. Bookmark the permalink. Thanks for this post, C! One thing to keep working on as you continue to post and work on your final paper is to think about using specific examples from the sources you cite. For instance, can you share a lyric or a particular musical phrase from “Alexander’s Ragtime Band” that illustrates Berlin’s cleverness? What’s a specific example of him employing American slang to increase his credibility as an inventor of musical Americanness? 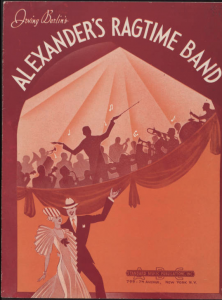 Another thing to consider is locating and analyzing primary sources that are less well-known but potentially just as revealing as famous works like “Alexander’s Ragtime Band.” What else did Berlin write that we may have forgotten (perhaps even purposefully)? Did he ever write a flop? Just some questions you might ask of a different subject as you write your next posts.